Honorary Service Awards can be awarded at 3 levels. Honors those who go above and beyond for the children of your school or area. Honors those who go above and beyond for the youth of multiple schools or your entire city. Honors those who go above and beyond for the youth of all of Ventura County. 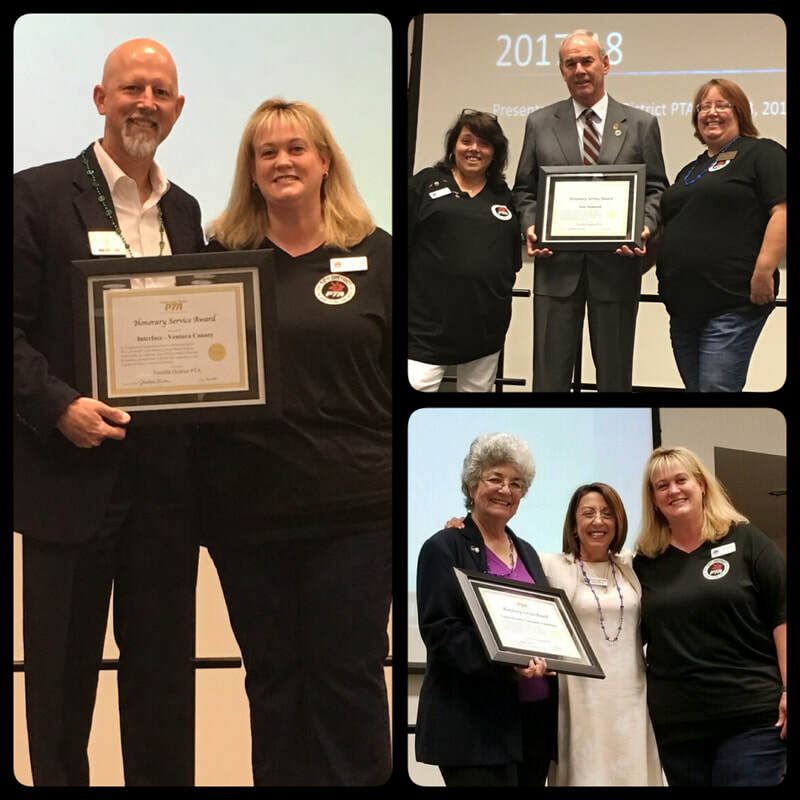 We are pleased to share that on June 9th, 2018 12th District PTA recognized 2 organizations and 2 individuals with Honorary Service Awards. They were Dr. Phil Hampton, Dr. Marcella Klein Williams, TOArts (Thousand Oaks Alliance for the Arts) including Angels of the Arts, and Straight up Reality Improv. They were all recognized for their outstanding dedication and service to the children of Ventura County! Please join us in congratulating them! Dr. Hampton and Dr. Klein Williams are co-founders of VC STEM. Dr. Klein Williams is the Oxnard College STEM Director and Dr. Hampton is a professor of Chemistry at Cal State Channel Islands, but he is also so much more. Science is his passion, and bringing STEM to the kids in Ventura County was something he was determined to do. In 2015, along with Dr. Klein Williams, they started VC Stem. The mission was simple, find a way to promote STEM, not just in college, but in our high schools, middle schools, elementary schools and preschools. Dr. Hampton didn't just say let's do this. He created a whole network of committees and community leaders to come together and realize a dream. He works tirelessly in our community, at science night at our local schools, reading to young people working with students at our area colleges. Dr. Hampton and Dr. Klein have applied for countless grants to fund this monumental endeavor and have been very successful. ​But that is not all, every fall, Dr. Hampton plans a science carnival with an average attendance of 1,200 people. He plans the activities, recruits the volunteers and then works the whole evening bringing science to life for so many Pre-K through 8th grade students. Dr. Phil Hampton and Dr. Marcella Klein Williams are one of the many great things about Ventura County and it was our honor to award them both with Honorary Service Awards. TOArts is an organization that brings the youth of Ventura County to the theatre specifically the Bank of America Civic Arts Plaza (formerly Thousand Oaks Civic Arts Plaza) at little to no cost by providing free tickets (for students ages 5 – 18) and free transportation for Title I campuses. The Angels of the Arts raise money to provide funds for Kids and the Arts. Kids and the Arts provides tickets and transportation for school-aged youth from Title I schools in Ventura County and tickets to all school-aged youth of Ventura County. Their Vision is: Providing enrichment and education in the Arts for ALL youth in our community, building self-esteem, promoting creativity and developing future generations of artists and patrons of the Arts. Schools throughout the county were able to bring approx. 3,000 students to attend performances of The Nutcracker in December, these included 2nd graders from schools throughout the county, they also had a second opportunity for students to see Sleeping Beauty in May. For many of the students this was their first (and maybe only) chance to see a ballet or theater production. 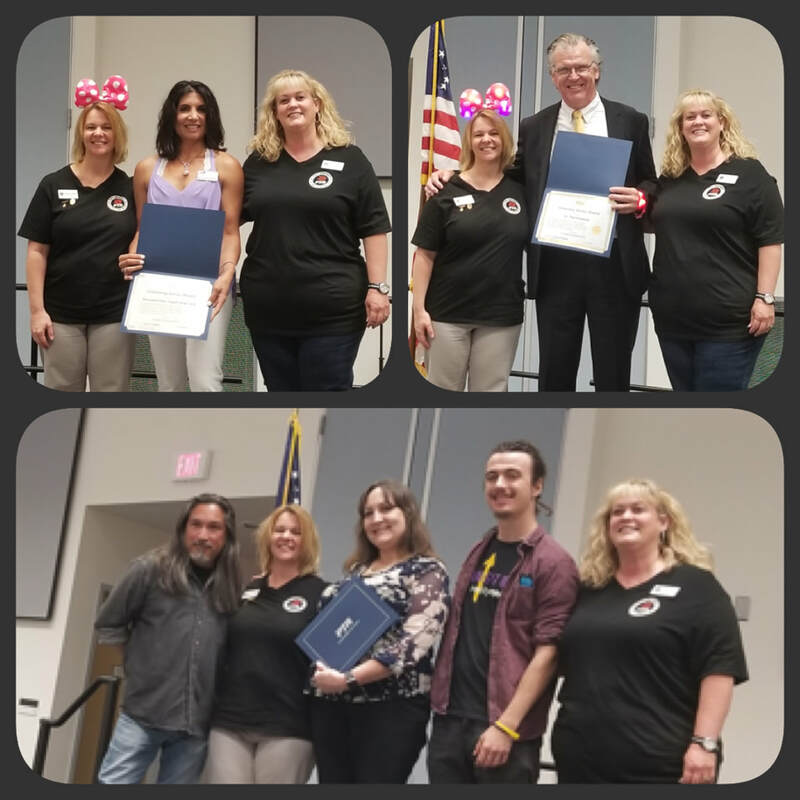 It was our great pleasure to award TOARTS and their Angels of the Arts with a Continuing Service Award for all that they do for the youth of Ventura County. Pictured upper left: Michelle Dearman (12th District President) with Niki Chopra (Development Director of TOArts) and Jill Belkin (12th District HSA Chair); Upper right: Dr. Hampton with Michelle Dearman and Jill Belkin; Lower frame: Roland Roberts (Project Coordinator), Katherine Kasmir (Founder/Director) and Mitch Boring (Video Editor/Workshop Facilitator) -Straight Up Reality Improv with Michelle Dearman and Jill Belkin. Straight Up is a Ventura County, California youth development project for ages 12-25 that promotes social change regarding underage and binge drinking, impaired driving, marijuana, prescription and over-the-counter drugs, HIV/AIDS prevention, and other concerns using improvisation and interactive techniques to engage discussion, explore issues, and develop personal and community solutions to these issues. This fun, Jeopardy-style game uses interactive software and individual response keypads to keep the students engaged while learning important information about alcohol and the dangers of underage and binge drinking. The game is customizable for age groups and subject matter. In this fully interactive workshop, the students use Social Change Theatre techniques to examine social norms regarding underage and binge drinking, identify problems, desired changes and possible solutions. They also have Programs for parents, educators and other adults - include interactive workshops for families, community presentations, and Reality Parties for Parents. Many adults feel drinking and drug use is a rite of passage and think teen parties are the same as when they were young. Straight Up youth want parents to face the current realities and learn why and how we need adults to help change these dangerous social norms in Ventura County. Teen actors portray scenes from a house party and voice the concerns expressed by local teens and young adults about trends in youth alcohol and drug use. After each performance or tour there is a facilitate community dialogue with a panel to answer questions and discuss ideas for change. Over the years many of us in PTA have had the opportunity to promote and attend these Reality party events throughout Ventura County. What an eye opening experience! It is a great opportunity for parents to really get to see “behind the curtain” of what really goes on at a teen party. It was a true privilege to present Straight Up Reality Improv with a Continuing Service Award for all they do for the youth of Ventura County. Our 2016-17 12th District Honorary Service Award recipients were: Ventura County Community Foundation, Interface Ventura County, and Stan Mantooth – Ventura County Superintendent of Schools. We are grateful for all that they do. Please join us in congratulating them for this well deserved award! VCCF is an amazing resource for non- profits, within Ventura County. They provide scholarships for our youth and they now provide a place for all the important resources and non-profits to reside. They provide grants and collaborative partnerships with our community as well. The VCCF is also home to the Library for Nonprofit Research and Development with over 1,000 print publications, books and periodicals on nonprofit management topics as well as a database for grant seekers. They help non-profits start endowment funds. The facilities on Mission Oaks Blvd are a haven for non-profits in Ventura County. A place where we can meet, and do the work of the organizations we belong to and not have to worry about pesky things like rent. 12th District is proud of our relationship with VCCF, hosting many a meeting and training in the beautiful building. We are very lucky in Ventura County to have access to this facility. VCCF is constantly supporting PTA and showing us that the youth of Ventura County matter to them! It is truly an organization worthy of recognition. Interface provides services and resources to those who most need it throughout our County. Family Resource Centers in Oxnard and Camarillo. Families have access to resources, information and referrals, counseling, case management services and parenting classes. Family Violence Intervention Services, which include victim support, prevention programs and accountability. Life Skills and Development Activities (just to name a few). One of the most amazing programs we in PTA have personally been able to experience is the Teen Dating Violence Prevention presentations that Interface provides at High Schools for parents and students. Congratulations to this year's recipients! Mr. Mantooth, has over 39 years of practical, educational, and management experience in K-12 school districts and the County Office of Education. Beginning in 1996, and until his appointment as County Superintendent of Schools in September 2008, Mr. Mantooth served as Associate Superintendent for Administrative Services with the Ventura County Office of Education. Mr. Mantooth’s specific areas of focus and expertise include financial systems and budget development, personnel administration, collective bargaining, facilities planning and administration, and risk management. Mr. Mantooth has shared his expertise while serving on a variety of statewide committees, including serving as the President of the California County Superintendents Educational Services Association (CCSESA). He is also a member of the Association of California School Administrators (ACSA) and the California Association of School Business Officials (CASBO). Mr. Mantooth is currently a member and past-Chair of the Board of Directors for the County Schools Federal Credit Union (CSFCU), member and past-President of Ventura County Schools Self Funding Authority (VCSSFA), and past-President of Ventura County Schools Public Facilities Financing Corporation. Mr. Mantooth serves on a variety of local committees and commissions including First 5 Ventura County, Ventura County P-20 Regional Council, Community Commission of Ventura County, United Way, Ventura County Community Foundation, and the Ventura County School Boards Association. Mr. Mantooth has a Bachelor’s degree from California State University, Northridge and a Master’s degree in School Business Administration from Pepperdine University. Mr. Mantooth holds a California Teaching Credential and a California Administrative Services Credential; he has been an adjunct Faculty Member at Pepperdine University, the University of La Verne, California State University Northridge and California State University Channel Islands. ​We truly appreciate everything Mr. Mantooth does to support the children of Ventura County!